Taking Flight: Visitors from Türkiye & Spring is Here! For the past two weeks, we have had three very special visitors from Turkey here at REGI. Ahmet Kütükçü, a veterinarian, Önder Cırık, and Derya Cil, biologists, have been exploring American and Wisconsin culture and experiencing a northern winter, but their main reason for visiting was to learn more about avian rehabilitation, care, and education as they develop the first-of-its-kind rehabilitation center in Turkey. Their visit even made it into the news! Check out this link! Marge is an excellent teacher (and now, tour-guide) and she made sure there was never a dull moment for our guests. 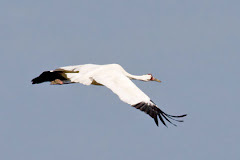 They had an action-packed 2 weeks beginning with a visit to the International Crane Foundation (ICF), which houses individuals of most, if not all, of the world's 15 species of cranes. They also visited a white-tailed deer farm to learn about housing non-avian species. In rural Wisconsin, we are accustomed to seeing these four-legged herbivores roaming through our backyards, but as they are not native to Turkey, they were an exciting "exotic" species for our visitors. ICF and the deer farm provide great examples of enclosures and exhibits which will help them as they design their own facility in Turkey. On one of their first days at REGI, they were greeted by a lovely snow storm. What does one do when they find themselves in the midst of a blizzard? Have a snowball fight of course! For a typical Wisconsin experience, Marge's grandson, Hunter, treated everyone to snowmobile rides around the property. To get a feel for historic American culture, they accompanied us to Klondike Days in Eagle River. They learned how to pan for gold, witnessed a Native American dance presentation by the Waswagoning Dance Theatre, saw chainsaw carvings of every kind, and just about everything else that Klondike Days has to offer. Aside from from all of the site-seeing, there is work to do :) The group got a chance to handle rarely-seen Snowy Owls and Sandhill cranes. For another break from all of the learning, the group learns how to make a snowman with help from Marge and Don's grandchildren, Hunter and Maddie. As always, more work to be done. Marge examined two Great-horned Owls and determined that they were ready to be placed in an outside flight enclosure to exercise and regain their strength. Watching and helping Marge assess REGI's patients will serve as a great experience as they treat their own patients in Turkey. As you may have noticed by this point of the blog, our three guests had a lot of new experiences during their short stay with us. There are so many things to do during a winter in Wisconsin; if you're only going to be here during the winter once in your life, it is obligatory that you take a stroll on a frozen lake. Ice fishing and snow angels are a bonus! One of their last days here, the group was able to get close to the resident Bald Eagles and Ahmet was able to handle one. He has handled many large raptors through his work in Turkey, but this was his first experience with a Bald Eagle. Photo above: Ahmet, Önder, and Derya, pose with Marge Gibson and Qushquluk, the largest Bald Eagle on record and one of the oldest as well. Photo above: Ahmet with Bald Eagle, Qushquluk, his first experience with a Bald Eagle. Not only did Ahmet, Önder, and Derya learn from us, but they also taught us a lot about Turkey and Turkish Culture through stories, gifts, and even preparation of food. Ahmet has a lot of experience as a Veterinarian in Turkey so he treated a few of the patients during his stay and taught us a few veterinary techniques. Photo above: Önder, Marge, and Derya gather around as Ahmet puts his expert veterinary skills to use while treating and wrapping the wing of a Barred Owl with nerve damage and flesh lacerations. They just returned from a trip to Bay Beach Wildlife Sanctuary and the NEW Zoo in Green Bay, WI, and have a few more exciting stops in the United States before heading back to Turkey. Ahmet has been in contact with Marge for quite some time and has been mentioned in previous blogs about the work he does with wildlife in Turkey. It was a great pleasure finally meeting and getting to know Ahmet, Önder, and Derya during their stay. We wish them all the luck in the world as they develop and succeed with their rehabilitation center in Turkey. We will miss you! Mother Nature tells me that spring is upon us and I think it just may stick this time. I spotted the first Turkey Vulture of spring this morning, gracefully drifting over the REGI property. This is the time of year where the sediment of winter begins to show itself again and spring cleaning commences once more. Lucky for us, we have beautiful wild turkey vultures in the world to help clean up some of the more unsavory bits. Another signal of spring is the full moon Saturday evening. This final full moon of the winter season is also called "Crow Moon" or "Worm Moon". The moon becomes full while crows caw the signal of spring and worms begin wiggling again as robins return in the North. Step outside tomorrow evening and take a peek at the lovely moon. Soon the relentlessly hungry babies of spring and summer will begin to arrive so we are taking deep breaths now while we still can. It is inevitable that we will raise baby birds every year here at REGI, but if you would like to help out your neighborhood baby creatures this spring, you can begin by not removing any trees on your property from now until the late summer/early fall. Even though there is still some snow on the ground, birds have already begun nesting. Many, many baby birds and mammals are taken to rehabilitation centers every year because the tree they were nesting in was cut down by humans. Do wildlife a favor and leave that "eye-sore" up for a few more months... better yet, leave it up forever! Deceased trees make excellent habitat for many animals and aren't as lifeless as they appear; burrowing insects provide food for woodpeckers and cavities provide shelter for little owls. As long as they aren't a hazard for human safety, leave them up! I was very pleased to take our visitors to and from Green Bay. They told me of their many wonderful, educational experiences there, and they even got to participate in some St. Patrick's Day activities and meet the mayor of Green Bay. We talked a lot about the similarities and differences between our two countries, and I learned many interesting things from them. To Onder, Derya, and Ahmet --The best of luck and success! Thank you very much! It is great to be a part of the wonderful REGI family. I have to say that I was very very wrong about my spring assessment. We are expecting another foot of snow.... Oy vey!